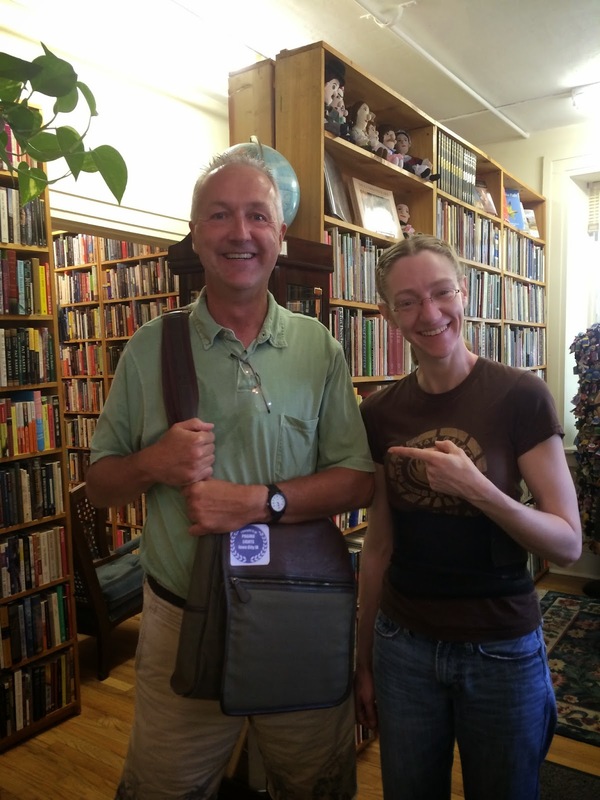 Do not judge a book by its cover and do not judge an independent bookstore by its name. From the outside, this place doesn't look like much. And the name of the place is not really fitting since the the owner, Nialle (pronounced Neal), is unaware of any unusual paranormal activity. Nothing spooky here. If you're a ghost hunter, cross this place off the list. If you're a bookstore lover looking for something to pick up, move this place to the top of the list. 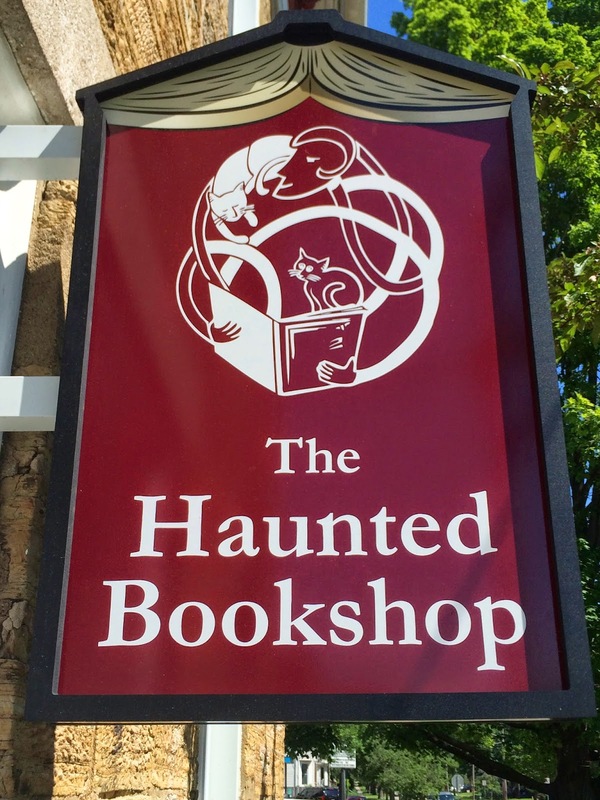 The Haunted Bookshop is housed in a 19th century building that is on the historic register, The Wentz House. It seems to be a typical house from that time period with a main level with multiple rooms and a straight staircase inside the front door to the second level with multiple rooms upstairs. This indie is kind of a maze of rooms and books, each room packed with books on shelves, floor to ceiling. The floors creak, many of the rooms have comfortable chairs to sit in, there are two cats, there is a piano, and the place oozes history. Could anything be more indie? The lifeblood of this indie is used books and they have a very active book buy-back program. You can certainly find recent publications by current authors but you can also find rare, out-of-print, and collectables. In addition to all these books they also have a small collection of greeting cards, a great children's room with various games, puzzles, small stuffed animals, and miscellaneous. No cafe here on site but there are several independently owned restaurants and cafes within easy walking distance (one block or less) of The Haunted Bookshop. It is always great visiting these indies and talking with the owners and staff. There are so many books here that Nialle and Ali have to be extremely organized and efficient to make things run so well. All the more impressive when you consider that they moved from a previous location and have been here less than a year. I get the feeling that this is well supported by the local population. And they have what I've come to expect as the norm in an indie, a cat. This place has two. 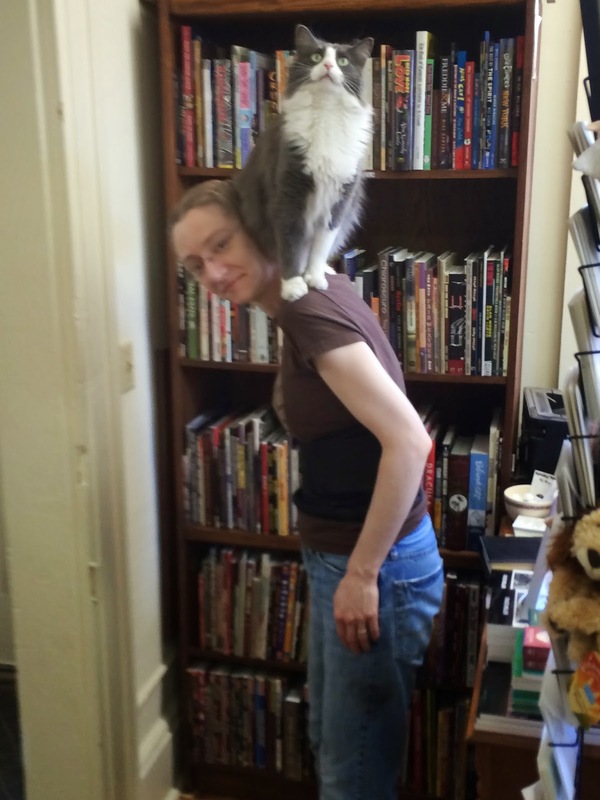 When I first started on this journey, it would be unique for me to see a cat in an indie. I've lost track of how many I've seen so when I go into place and they don't have one, I put the antihistamine back in the bag and breathe a sigh of relief! Many of you know about Prairie Lights in Iowa City. When you visit here (not IF), you now have another indie to check out. Both of them are great. Go to an indie and buy a book. Bonsoir. CURRENTLY READING: The Orphan Master's Son, Adam Johnson. Almost done. How the main character endures in North Korea is unbelievable. Makes one thankful to be in a free country. 3 stars. RECENTLY FINISHED: Killing Floor, Lee Child. Apples (this is a person) said I needed to read a Jack Reacher novel. This was it. Decent, 4 stars. RECENTLY PURCHASED: A Good Scent From A Strange Mountain, Robert Olen Butler. Parsecs To Go, Poems Of Protest, Chuck Miller. I'm not much of a poetry person but this was highly recommended. It looks very good and if the NYC literary world find out about this one, it will be huge. You heard it here first. Nothing scary about this place! Go in and buy a book! One of several rooms on the main floor. 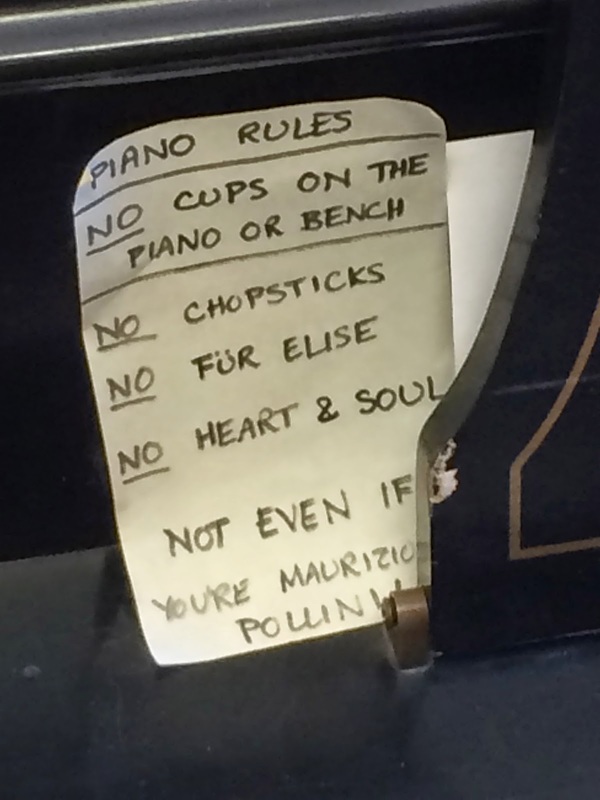 Shouldn't these rules be posted on all public pianos??!! Can we make this a law??!! 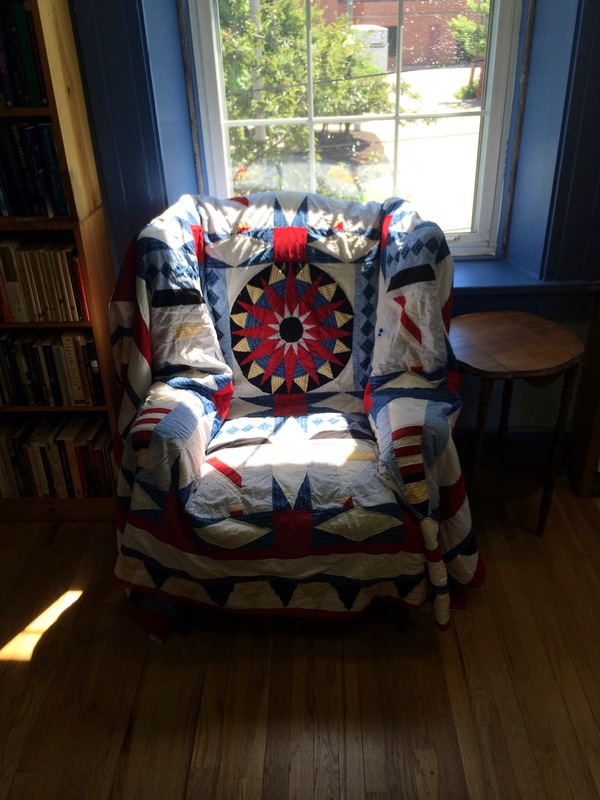 Lots of chairs to sit in and test drive a book, especially ones like this upstairs. The owner, Nialle, with one of the resident cats. Two great indie people! 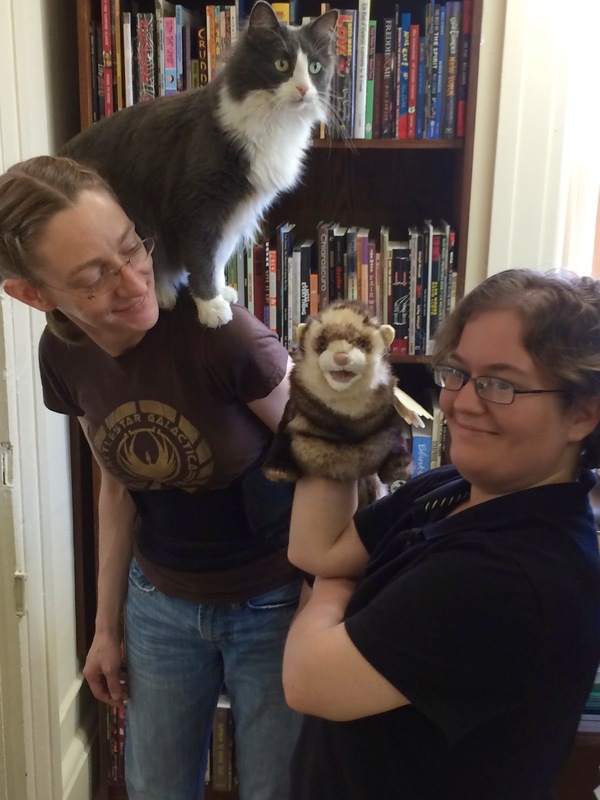 Nialle (L) with cat (real), and Ali (R) with ferret (not real but sure looks it!). Yours truly with the owner of The Haunted Bookshop, Nialle. I've met several independent bookstore owners on my journey and they all have one thing in common (besides being nice people and avid readers! ), a passion for their job. Sue at River Lights in Dubuque is no different. When you get a chance to REALLY talk to these people you find out how thoroughly invested they are in their business and profession. Their business is selling books and here in Dubuque, IA, business is good. This indie is thriving due to great local support and tourism. I got a great positive vibe from Sue about this store and its future and this is incredibly refreshing from an indie bookstore point of view. However, as many of you know this outlook does not come about without a lot of work and Sue, her husband, and her staff have put a lot of time into this store. 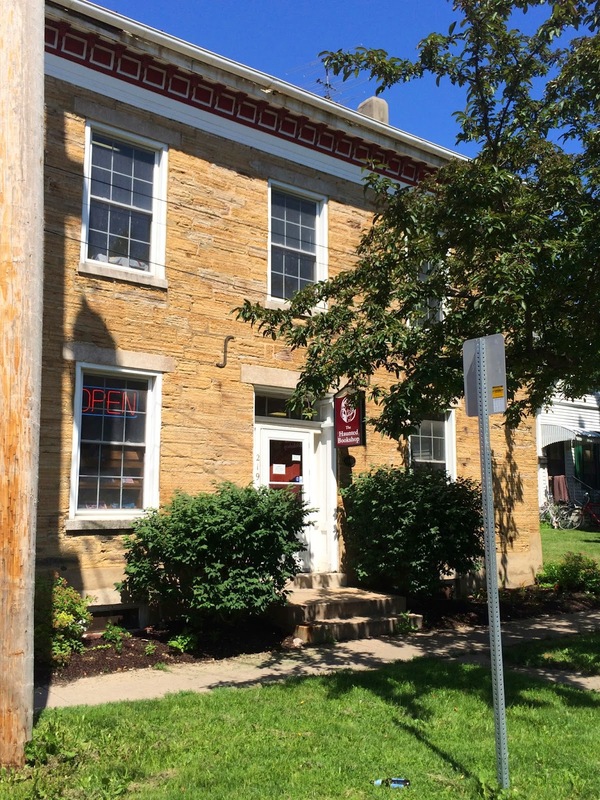 This store is also in a great location in downtown Dubuque, in an area that is experiencing a revitalization and renewal. Located within easy walking distance of eateries and unique shops. River Lights does not have a cafe but I highly recommend walking across the street to Jitterz Cafe for a latte and wifi. 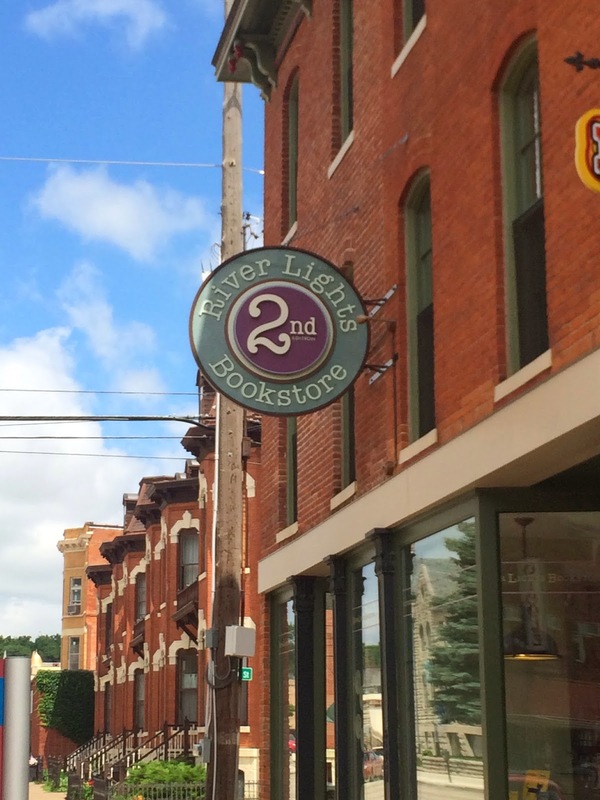 In the indie bookstore industry, Prairie Lights in Iowa City is the place that many have heard of and deservedly so. But you need to know that there are other outstanding indies in Iowa. If you live within driving distance of Dubuque, you need to make River Lights a destination. This place is a gem and you need to discover it if you haven't already. 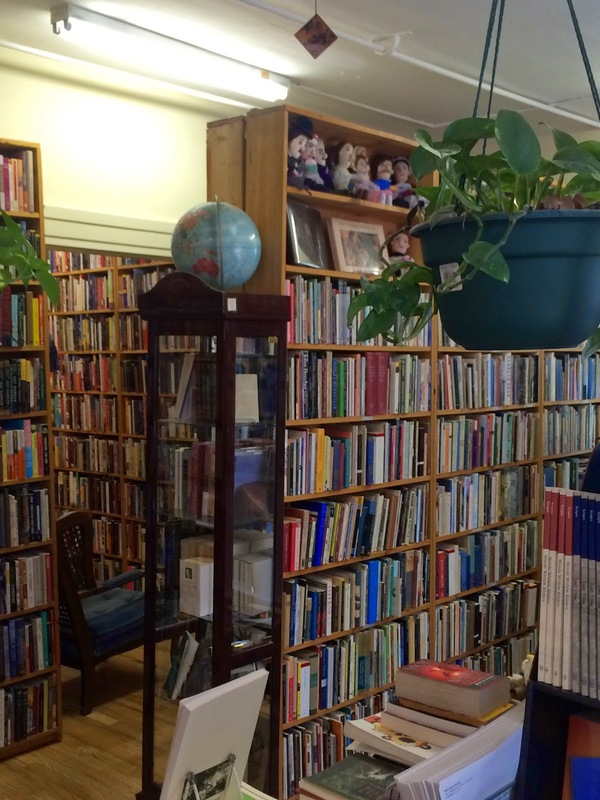 One level bookstore, well-organized and maintained, and lots of books to choose from. Great area in the back where they host book readings. Great children's area with child-proof and spill-proof chair covers. They also have some periodicals available as well as a small assortment of greeting cards and other small miscellaneous type items. There are also several places for customers to sit down and test drive a new book. These posts about indies are somewhat repetitive when talking about the staff. Sue the owner and her staff, Andrea and Fran, were super. People, get to this place and have a chat about books! Nothing better than talking to these people and sharing ideas about the books they sell, what they like and don't like. If you can't find a great recommendation from people like this, you're not trying. River Lights is a keeper so put it on your list. Go to an indie and buy a book. Bonsoir. CURRENTLY READING: The Orphan Master's Son, Adam Johnson. Half way through it. It's pretty good, survival in North Korea. RECENTLY FINISHED: Pietr The Latvian, Georges Simenon. An Inspector Maigret novel. Think Sherlock Holmes chasing a bad guy in Europe, early 20th century. It was good, 3 stars. The Lincoln Conspiracy, Timothy L. O'Brien. Think Sherlock Holmes hunting down a conspiracy twist about the Lincoln assassination. Historical fiction. Very interesting. 3.5 stars. RECENTLY PURCHASED: The Cuckoo's Calling, Robert Galbraith (pseudonym for J.K. Rowling). The Supremes at Earl's All-You-Can-Eat, Edward Kelsey Moore. They both look great. Off to the "piles waiting their turn" they go! Outside River Lights, located on Main Street. So Americana! Great area in the back of the store. They rearrange this space and host book readings here. Three of the greatest people you could talk to at River Lights. From L-R, Andrea, Sue the owner, and Fran. Thanks for a great visit, ladies! Quiz: Which one is Indie Bob? Clue: See picture above. Process of elimination. Figure it out. Every indie that has the space should have chairs like these! Front of store.